Part 1 General and primary material: Primary and secondary material explained; Primary material; Secondary material; Legal research, using law libraries, law librarianship and teaching law; Information on the legal profession. Part 2 Topics: Introduction; The law, legal history and the legal system; Conflict of laws; Constitutional and administrative law; Human rights; Immigration law; Public revenue and taxation law; Employment and industrial relations law; Environmental law; Planning law; Internet and computer law; Criminal law; Civil procedure and the courts; Family law; Contract law; Tort; Equity and trusts; Property law; Landlord and tenant law; Intellectual property and media law; Wills, probate and the administration of estates; Company and partnership law; Business law; Consumer law; Banking and financial services; Insurance law; European law; International law; Appendix: Legal publishers and Internet bookshops. Given the vast amount of legal information available, it is sometimes very difficult - and certainly very time consuming - to know where to start looking for the specific information you require. This book, covering the most up-to-date information sources (printed and electronic), helps guide the reader towards the information they need. It is an accessible and easy-to-use directory of legal information sources for librarians, lawyers, students and anyone needing legal information. The book covers mainly British and European Union law and includes general material and the main subject areas, including online and internet sources. It also lists reference material, such as legal dictionaries and directories. The book is essentially a directory of information sources, with publishing details (including ISBN), and short comments where useful. Electronic sources are mentioned where relevant, with details of scope and any limitations of coverage. 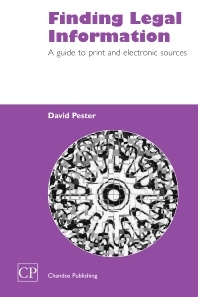 David Pester, who has a law degree, has worked at the Institute of Advanced Legal Studies and House of Lords Library in London. He currently works at the London Metropolitan University library.